Outstanding performers from India's infrastructure equipment sector were once again honoured in 15 different categories at the 5th Annual EQUIPMENT INDIA Awards and CEO Forum, held in New Delhi on February 16, 2018.
said to augur good tidings. Or so it is believed. Maybe, it was in continuation of this tradition that the city successfully held yet another edition of the Equipment India Awards. The hall at The Lalit was filled to capacity by the time the event got underway. There were easily around 200 people in that space. The who's who of the country's construction and infrastructure equipment sector were all well-represented. After the economic uncertainty surrounding the rollout of landmark reforms such as demonetisation and Goods and Services Tax (GST) over the last couple of years, the mood this time was quite upbeat. In fact, the energy lit up the faces of those in attendance. The fifth edition of EQUIPMENT INDIA Awards was hosted by the non-profit Foundation of Infrastructure Research Studies Training (FIRST) on February 16. Since 2003, FIRST is engaged in researching out and tracking India's infrastructure development initiatives. It monitors infrastructure-related projects, right from the conceptual and planning stage to implementation and commissioning. 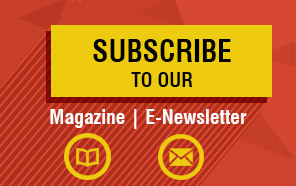 It regularly releases sector reports that provide timely and credible information on emerging business opportunities. 'Now you just have to be on the IT platform, and the way the system has been designed, you don't have to interact with the tax authorities at all,' he added. He urged stakeholders to feel free to reach out to him if they had any concerns. 'The government obviously knows that if it has given the pain of the kind of demonetisation and GST, it now needs to push up public spending as much as possible and press the paddle for the economy,' he added. Ten years and 120 issues later, EQUIPMENT INDIA seeks to fulfill the information needs of the booming construction equipment industry. Today, it is a strong brand that serves as a reference point to provide best-in-class information on technologies, trends, projects and industry professionals. The next edition of awards is going to be held in October this year. The idea is to factor in sales in units for 2017 as those figures are released only after the first quarter. Also, with the world's biggest festival of democracy, the Indian general election scheduled early next year, most government contracts will be awarded well in advance. with the CONSTRUCTION WORLD Awards and the 'Global Construction World Leadership Summit',' informed Padode. A CEO forum on the theme of 'Technology to Drive the Future of Construction and Infrastructure' was organised before the awards ceremony got underway. The panel discussion was moderated by RK Pandey, Member Projects, National Highways Authority of India (NHAI). He observed that these developments were also helping the market become more matured. Speaking on the government incentives to the infrastructure from the industry perspective, Chandrashekar V, Vice President (CE), Gmmco Ltd opined that technology must be imbibed in construction methodology. 'Technology can then be adopted in all the implements to increase the speed of operation and to reduce costs,' he said. Speaking about monitoring of equipment he said, 'The construction industry is changing. Most of the sub-contractors are becoming owners. They like to monitor equipment performance and operational costs. The equipment will be connected, with its performance being viewed on laptop, sitting in a room.' He also said that most organisations were using customer relationship management (CRM) and enterprise resource planning (ERP) software to analyse data, and these were the benefits of technology being adequately shared with their customers. Girish Jaggi, CEO, Hire My Machine said that he was increasingly making use of Uber as that spared him the hassle of either driving or finding parking space. 'That's why it's the need of the hour that we start utilising the equipment which are lying idle. Being a part of the construction business, I believe that our assets become a liability when we don't have work. At such times, those assets can benefit us by being hired out,' he said. In his view, the only challenge was to work on enhancing the 'faith factor' between the supplier and hirer. SP Rajan, Head - Plant & Equipment, L&T Construction said, 'We now need to go to the next level of the competition in the industry. That's possible only by embracing digitalisation and technology as well as automation. There is immense opportunity in the industry that we can utilise to shrink the completion cycle of a project.' He cited how in Australia a single motor grader is effectively utilised to do the same amount of work that ten do in India. He attributed this gap on a reluctance to try new things. Rajan also sought the GST Council's intervention in addressing the issue of lack of uniformity on taxation on construction equipment across states. This year's Awards recognised the achievements of people and companies and honoured the excellence in 15 categories. Sandeep Singh, Managing Director, Tata Hitachi Construction Machinery Co. was named the EQUIPMENT INDIA Person of the Year. Singh was unanimously chosen for the honour by an eminent 11-member jury for his notable contribution to his organisation by engineering a turnaround of sorts, thereby winning the coveted award for 2017. 'I would like to dedicate this award to my team at Tata Hitachi as also dealers and vendors who have really supported us to produce good quality machines and take care of our customers,' Singh said in a video recorded message that was played on the occasion. JCB India was chosen for the EQUIPMENT INDIA Award for Leadership in Construction Equipment for its contribution to the construction equipment industry over the past 39 years. Awards were also conferred on Bestseller products in 12 categories: Compactors, Backhoe Loaders, Mobile Cranes, Crawler Dozers, Wheeled Loaders, Skid Steer Loaders, Rigid Dump Trucks, Asphalt Finishers, Crawler Excavators, Mobile Compressors, Motor Graders and Mini Excavators. 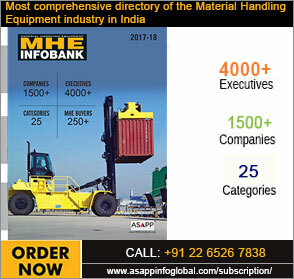 Copies of the 10th Annual Issue of EQUIPMENT INDIA and MHE INFOBANK edition were also released on the occasion. The 5th Annual EQUIPMENT INDIA Awards and CEO Forum 2018 was presented by Apollo Tyres and powered by ExxonMobil Lubricants. Ending on a positive note.. It is such heartfelt acknowledgements from the friends and associates in the industry that keep one going 24x7.